It’s almost the weekend and a long weekend at that–anyone else excited? Tonight I’m going to see Clarence Carter perform at an outdoor venue (who knew Roanoke could get a cool soul musician??? ), then tomorrow is a half day of work, and then I’m off to Richmond for a bit. Vegan food on the horizon! I’m thinking I’ll have to talk my uncle and his wife into getting Ethiopian–it’s been far too long since I had some injeera. Anyone else have exciting plans? Part of getting ready for Clarence Carter was preparing a bit of concert food. Since they don’t allow coolers in (I hate that policy–I have no desire to buy an overpriced Bud Light) I decided not to go whole hog (err…tofu) with the picnic idea, but rather to just bring a little snack. And last weekend when I picked up the sweet red cherries at the farmers market I knew almost immediately what I wanted to do with them. Make cherry empanadas of course! So tonight I’m taking some empanadas to the concert. A little bourgeois, maybe, but whatever. Now you know me, I can’t just make a simple version of anything (unless it’s intentionally simple). Thus the gluten-free buckwheat cherry chocolate empanada was born. Maybe this empanada isn’t exactly authentic, maybe it’s more like a handpie–I don’t know. All I know is that they’re out of this world, with hardly any sugar added. Who would want to mask the tart sweetness of the cherries? The buckwheat gluten-free pastry gives the empanada a savory side which, I think, pairs well with the tart-sweet-smooth chocolatelyness of the filling. And instead of making a typical cherry pie-like filling, I went with the apple pie filling route: just cherries, chocolate, a dash of sugar & lemon juice, voila. They get two thumbs up from my non-gluten-free, non-vegan testers, so I guess that’s a win. So go make some fruit empanadas this weekend with whatever is fresh in your area! You won’t regret it! In a large bowl, combine the gluten-free flours, salt, sugar, and xanthum gum. Using a pastry cutter, cut in the Earth Balance in tablespoon size chunks until it is mealy with no chunks of Earth Balance left. Add the ice water a little at a time, using a spoon to evenly distribute it until a large clump/ball forms. You only want the pastry wet enough to press into a ball–no wetter. Wrap in saran wrap and let chill in the fridge for 1 hour. Meanwhile, pit the cherries and cut them in half. I used this trick to pit them from the Kitchn and it worked great! Chop the chocolate. In a small bowl, combine the chocolate and cherry halves with the sugar, lemon juice, and rice flour. Set aside. Preheat the oven to 350 degrees F. Spray two baking sheets with oil. Take the pastry out of the fridge. Using only a small chunk at a time (a small fist-sized chunk), roll out the dough between parchment/wax paper or saran wrap (I used the latter and it worked fine). You want the dough to be approximately 1/4 inch thick, no thinner. Using something approximately 4″ in diameter (I had a giant coffee cup that worked), cut a circle from the dough. Place on the baking sheet where you’re going to bake it (the dough can be hard to work with, you don’t want to use it much) and place 1-2 tbsp of the cherry mixture on one half of the circle. Fold over in half and pinch the edges closed. Repeat until there is no more dough/cherries. Bake for 20 minutes until golden brown at the edges. Let cool for 15 minutes before eating. Those look fantastic! I don’t think I have had an empanada since my pre-vegan days.. let alone a GF one. Nice job and great pic! I will have to try this out. Thank you. Um, can you say YUM!? Those sound fantastic. I am definitely bookmarking this for when cherries are in season in my neck of the woods; I love cherries, chocolate and buckwheat so this is right up my alley! Thanks and enjoy your concert. I’ve never been a huge fan of cherry and chocolate mixed, but those look delicious and I am definitely going to have to make them! Awesome idea for a picnic food! I love cherries! 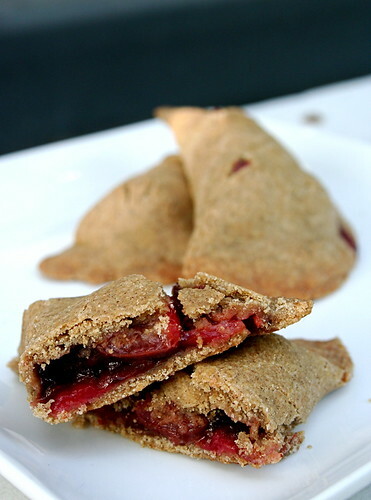 I never would have thought of something like cherry chocolate empanadas, they look delicious! Wow..I never would have thought to use buckwheat for something sweet but I can imagine that the grainy taste is really good with the chocolate and the cherries! Nice! #1. Clarence Carter! dan would totally be so jealousfaced. he used to play “Stroke’n” all the time. ah ha ha! i hope the show was super fun, Jes! #2. the nile rocks socks. sometimes the service is a tad slow, but seriously – it’s awesome, and i love that their injera is 100% teff flour. there’s another ethiopian place further downtown, but they use some wheat flour in there. sadface for the gluten-free peeps. oh, and i know you’ll see it on the menu, but all the vegetarian entrees you can choose from are vegan. squeeeee! i hope your weekend here in rva is gloriously fun & tasty. #3. buckwheat cherry chocolate empanadas?!?! i love you, Jes! you just combined 2 of my favs, cherries + empanadas! i made some empanadas for a friend’s 40th birthday party back in march, but i never got to enjoy them ’cause i used whole wheat flour the first time around. i’ve gotta make these, Jes – thank you sooo much for the recipe. now all i need is some fresh cherries (and the self control not to eat them all before using some for empanadas. ah ha ha! )… w00t! Sweet, gluten-free empanadas, what a creative concept! They look like a great grab-and-go snack, too. I’ve just recently discovered your blog and I am SO excited. All of your recipes look so adventurous and interesting and flavorful, and this recipe is an excellent example of that. I cannot wait to try everything! cherry + chocolate = my favorite! Jimbo at Big Pine wants to know if there are any of those things left! Looking forward to you taking the lead on our new venture–Big Pine Provisions. You were awarded the Sunshine Award on my blog! Check it out and come claim it! Thanks for blogging! Keep up the great work! Now THIS is talent! Those look absolutely amazing! Oh. My. Goodness. We’ll be giving these a shot. Was great to meet you at market today. As a busy gluten, dairy, soy-free family, we are excited about seeing you more!! Just tried making these. My dough kept cracking. Is there a trick to folding them? I’m sure they will be tasty even if they explode a bit! Mine cracked a bit too–I think the trick is getting the dough as moist as you can and then very very gingerly folding them.